Our thanks to Tonia Skinner Hannemann and Leah Strong Schenkel for reaching out and sharing their stories with us. The Radrizzi and Strong family stories have been intertwined for almost a century—beginning before they became neighbors and lasting long after their block of Jay St. was demolished. 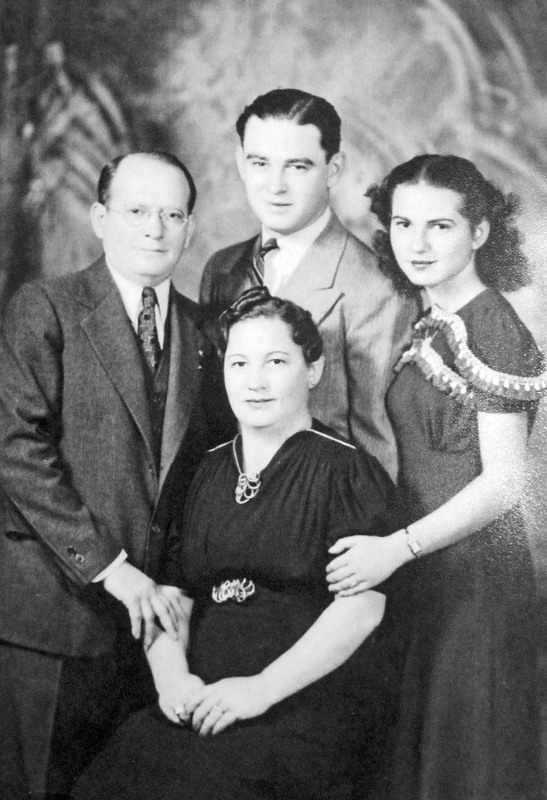 It all began when Ethel Strong, a Yiddish-speaking Russian immigrant, befriended the Radrizzi sisters, Ada and Antoinette (Toni), who, with their parents and siblings, had emigrated from Italy. The young women were close in age. They had arrived in the United States within a few years of each other. And they worked at the same factory. 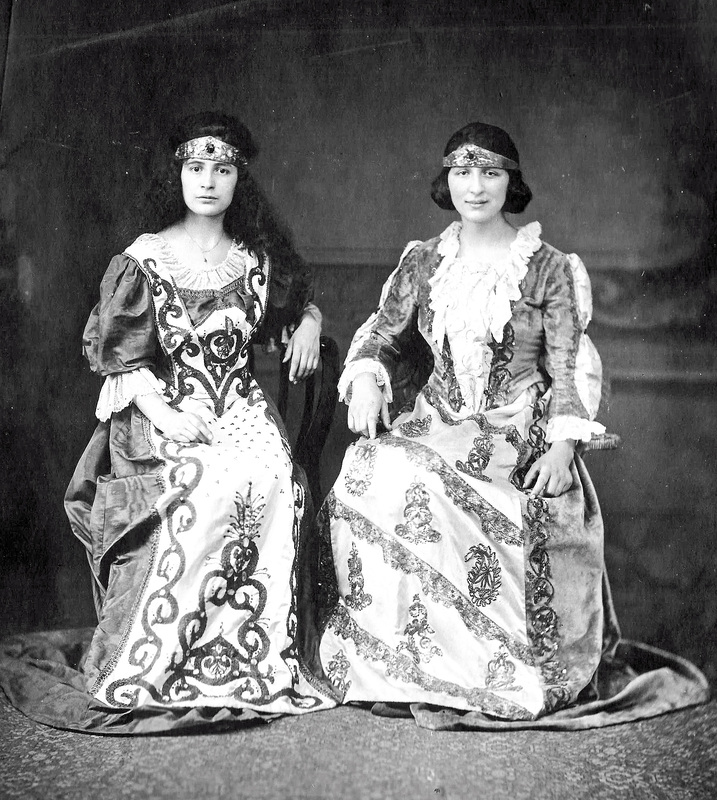 Toni (left) and Ada dressed for their performances as Desdemona and Emilia in the Albany Italian Dramatic Club’s 1920 production of Shakespeare’s Othello. Courtesy Tonia Hannemann. The Radrizzis were the first to move to Jay St. In 1919, when Victor Radrizzi and his wife, Adele, purchased number 14, next door to Marion Harvey (a.k.a. Mae Carlson). This was the first of several Jay St. rooming houses the Radrizzis would acquire. 14 Jay St. was both an investment—the family rented out furnished rooms—and a home, where Victor and Adele lived with four of their children, Ada, Toni, Josephine (Jo), and Louis. (The eldest, Caesar, returned to Italy.) For the next 40+ years, Jay St. would remain the home to the Radrizzi clan, and rooming houses, along with restaurants, would remain the family business. In the basement, Victor ran a still and engaged in a bit of bootlegging. In later years, children digging in the backyard would unearth remnants of the glass bottles smashed and buried to avoid arrest for Prohibition violations. This tactic didn’t always work. Ad from the Albany city directory, 1919. Around the same time they moved into 14 Jay St., Victor and his son, Louis, became restaurant proprietors. First, Luigi Alborino took on Louis as a partner in La Bella Napoli at 115 S. Pearl St. Then Victor, known affectionately as Pop, opened the Savoia on William St. Both restaurants specialized in Italian cuisine. And both businesses were hit hard by Prohibition. In March 1921, a Bella Napoli bartender was arrested for serving whiskey to the wrong men. At the Savoia, a month later, federal agents discovered suspicious liquids in bottles labeled “Hungerford’s Syrup,” a popular brand of soda fountain flavoring. A raid on the Radrizzi residence four days later uncovered 150 gallons of mash and 4 barrels of wine, along with a supply of empty bottles. In both cases, the charges were settled with a fine of $150. After the repeal of Prohibition, when Victor opened Pop’s Spaghetti House (aka Pop’s Grill) at 39 High St., his daughter Ada’s name was on the liquor license. 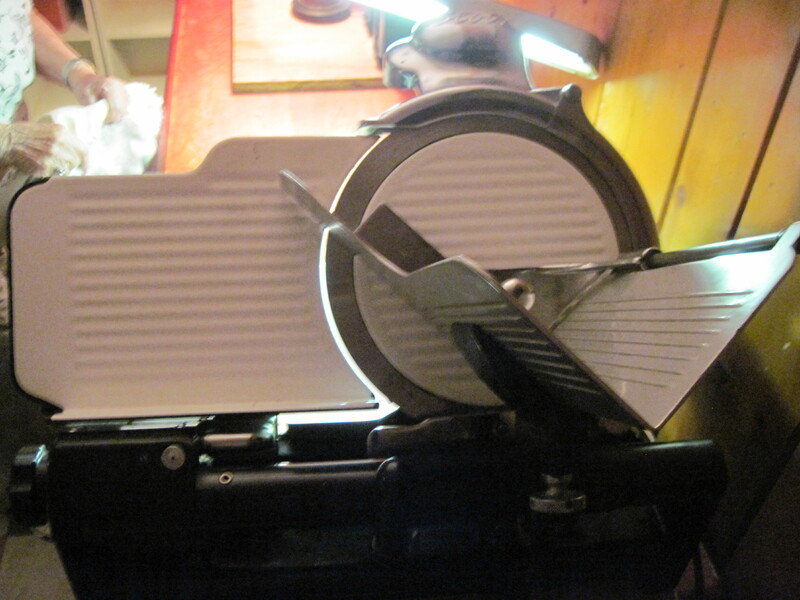 The meat slicer from the Strong grocery is now in Leah’s basement. 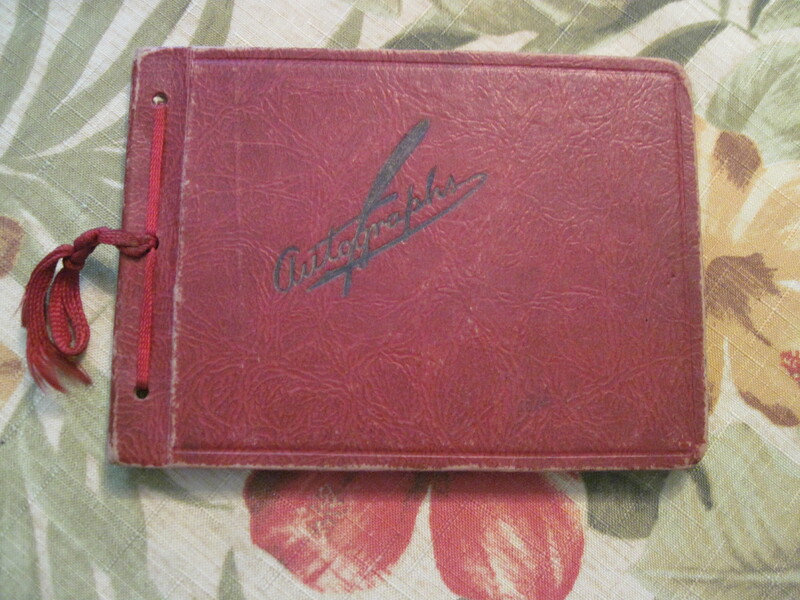 One of Leah’s autograph books from the 1930s. The friendship that developed between Leah and Toni’s daughter, Ginghi, drew the families closer together. The two girls played in Lincoln Park, picking tender dandelion greens for Radrizzi family salads and, probably, wine. Sometimes for fun, they would hang out at the police station on the corner of Eagle and Beaver streets. Leah, an avid collector of autographs, has a book from those days full of signatures from neighborhood celebrities, including police officers and her family’s roomers. Abe and Ethel Strong with their two children, Elihu and Leah, ca. 1938. Courtesy Leah Schenkel. Although most of the men in the neighborhood were tenants—who stayed put for only a few weeks at a time—the rooming house owners (mostly women) developed close, almost familial, bonds. Ada’s daughters, Tonia and Kathleen, grew up calling Katherine Cesario, who owned 22 Jay, Aunt Kay. Ethel and Abe were their Grandma and Grandpa Strong. After Ethel introduced the recently widowed Toni to her second husband, Lino Bionda, the bonds grew even stronger. A cook at Keeler’s, who roomed with the Strong family, Lino would later become Louis’s business partner. Tonia and Darwin Skinner in front of their Jay St home. Courtesy Tonia Hannemann. In 1946, Ada bought 18 Jay St. from the Albany Savings Bank. At the time, her marriage to schoolteacher E. Darwin Skinner was already failing. He moved out the following year. But Ada and her daughters stayed put. Like her mother and sisters, Ada rented out furnished rooms. She also worked nights and weekends at the Liberty Tavern in Rensselaer, the restaurant owned by Louis and Lino. Ada’s sister Jo and her niece Ginghi helped out by watching the girls, while their mother waited tables. A room for rent at 18 Jay St. NYS Archives. A lot of labor went into raising two girls and running a rooming house. Tonia and Kathleen did what they could to help out. Washing and drying dishes was one of their chores, along with ironing and dusting the banister (with breaks for sliding down it). Over the weekend, when their mother tidied up the rooms and changed tenants’ linens, the girls would help out. 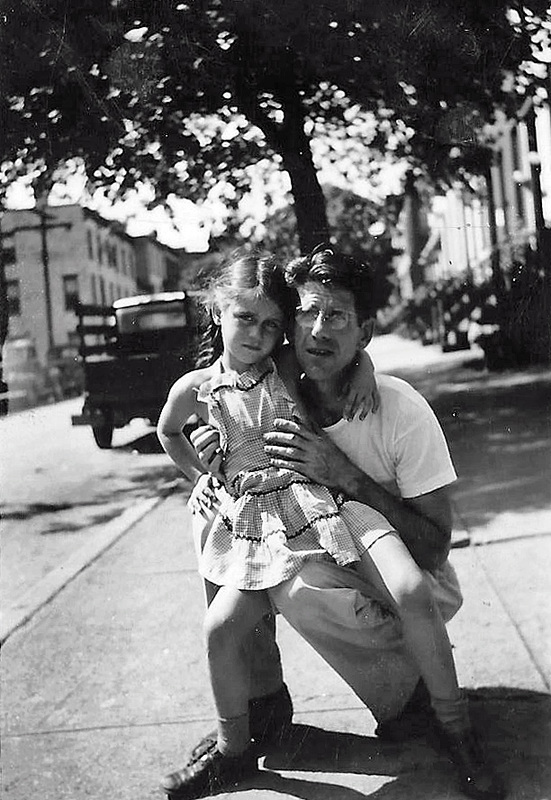 Without a car, their mom also relied on them to help carry groceries home from the Empire Super Market on Hudson Ave. below Philip St.
Leah and Sheila, ca 1945. This World War II era painting on tent canvas hangs in Leah’s living room. Courtesy Leah Schenkel. Although she did her best to help her mom, Tonia found plenty of time to play. On Saturdays, Leah and her husband, Harold Schenkel, brought their daughter Sheila to visit Ethel and attend services up the street at Temple Beth Emeth (now Wilborn Temple). Afterward, Tonia and Sheila would eat bologna sandwiches and drink soda in the kitchen behind the Strong’s grocery store. Then they would head outside to play. Often, they would walk over to Hudson Ave., a block away, to see a movie at the Eagle Theatre or to check out the ten-cent comic books at Irving and Mildred Lozoff’s Pharmacy. On special occasions, Ethel and Ada treated the girls to lunch at the Venice Restaurant, between Lozoff’s and the movie theater. Tonia in her mother’s flower and vegetable garden, behind 18 Jay St. Courtesy Tonia Hannemann. 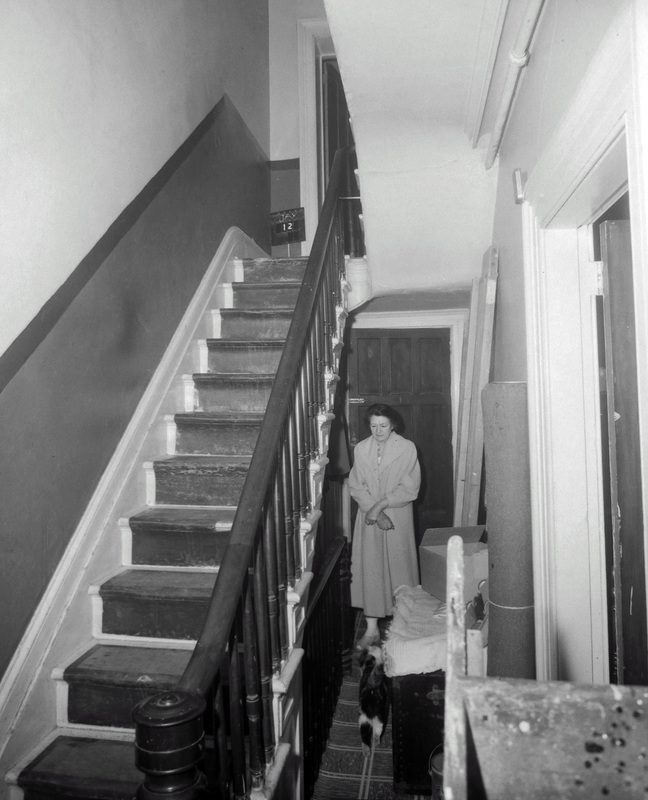 In 1954, Ada bought 16 Jay St. from her niece. (The house had been in the Radrizzi family since 1926.) She moved her little family into the new house and continued to rent rooms in both properties. Like her siblings, Ada still lived within the same 2 blocks of Jay, between S. Hawk and Eagle streets, where their parents had settled in the 1910s. The four Radrizzi children would remain there until they were forced to move for the South Mall redevelopment project. Widowed in 1956, Ethel closed the basement grocery store but continued to live in the neighborhood and to rent out rooms and small apartments on Jay and High streets. She helped her son Elihu with his business, Tri-City Venetian Blind Co., at 118 Hudson Ave., across from the Empire Super Market. Ethel’s job was to re-string the blinds after they’d been cleaned. State photographers took this picture of Tonia’s Auntie Jo in her 12 Jay St. rooming house, April 1963. NYS Archives. Both Ethel and Ada were in their early 60s in March 1962, when they learned that the State of New York had appropriated their properties. As a result of the South Mall, Ethel retired from the rooming house trade. The reimbursement she received from the State wasn’t enough to replace the houses she had lost. She lived out the rest of her days in the Hollywood Ave. house, where her daughter still lives. With the addition of a green felt pad, Leah’s dining room table doubled as a card table, when it was her mother’s turn to host the Tuesday night poker game. Ada found herself in a similar situation. Payment for her two Jay St. properties wasn’t enough to cover the cost of the replacement rooming house at 35 S. Lake Ave. And one house didn’t generate the same income that two had. But she couldn’t afford to retire. 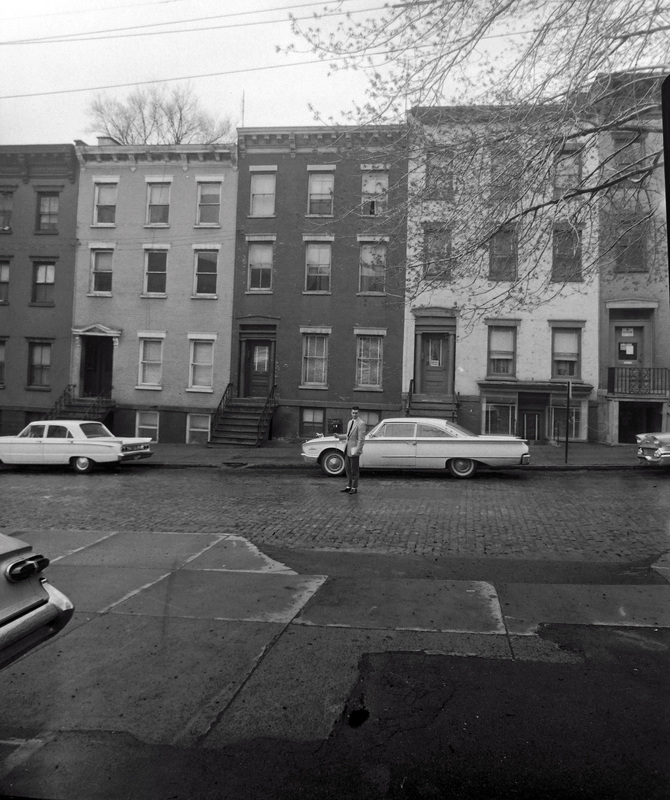 16-18-20 Jay St., April 1963. NYS Archives. 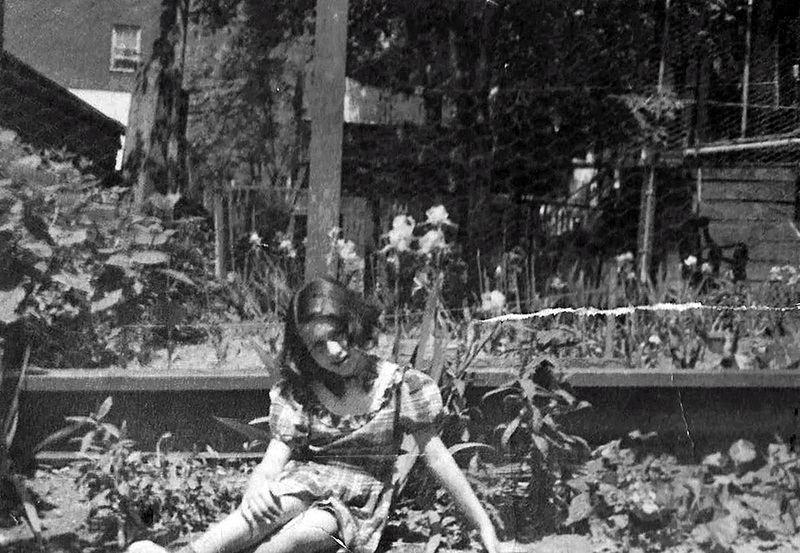 In the summer of 1964, not long after the move, Ada suffered a fatal accident. Both her daughters were out of state, when they learned their mother was in a coma. Kathleen was enrolled in medical school at the Ohio State University. Tonia had recently married her Schuyler High School sweetheart, Otto Hannemann, and was living with him in Colorado, where he was stationed with the Air Force. The girls rushed back to be with their mother, but Ada never regained consciousness. It was at her funeral that Tonia discovered she was pregnant with her first child, Andy, born the following spring. The story of the Radrizzi and Strong families doesn’t end with displacement, dispersal, and death. In 1968, while Otto was stationed in Thailand, 25-year-old Tonia returned to Albany. Although she was living on her own with an infant and 4-year-old to care for, she was not alone. Throughout that year, Leah and Sheila, along with Tonia’s Auntie Jo and even her estranged father, made sure that she and her children were comfortable and their needs met. The strong bond between Leah, Sheila, and Tonia that developed on Jay St. still survives to this day. 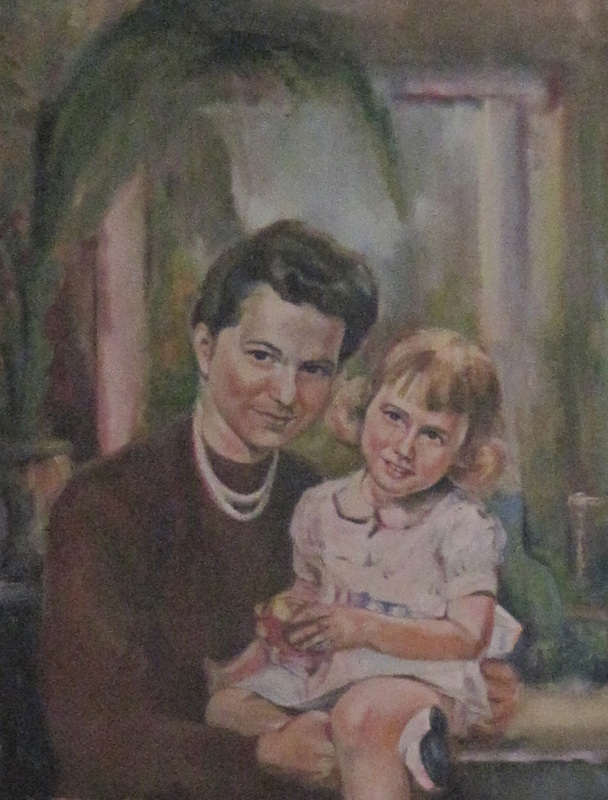 Note: Header photo of Ada Radrizzi and her niece Ginghi, ca. mid-1920s. Courtesy of Tonia Hannemann. All these stories make me glad for the bonds the people formed within their community—a testament to what we human beings can be to one another—and sad for all they lost—a testament to how horrible we can be to one another in the name of greed of power. I pray those who have passed rest in peace, now, and their loved ones are comforted not only with fond memories but also with strong bonds that survive to this day. The bond between these two families, which has survived 4 generations, was motivated us to tell this story. We’re so pleased that Tonia reached out to us and introduced us to Leah.